Start with your 4in cakes put together, frosting between each layer. With a bread knife begin cutting from the top forming the pineapple shape. I like to freeze for about an hour for more control. 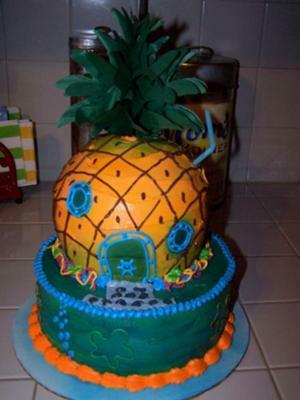 Next frost your pineapple with the yellow frosting, then using the green color mist spray your pineapple giving it some coloring like the real fruit. It is helpful to have a picture of the house for a guide. Using your stencil, take the blue color mist and spray your door and portholes. Pipe blue icing around your door and portholes giving it some detail. Now begin piping the lines around the house with the brown icing or chocolate would work too. Pipe around the house at an angle going all around the house the going in the other direction forming a diamond pattern. Now for your base using your 8in cakes. Put together and frost green. Using the blue color mist again, give your base some depth making it look like a ocean. Once complete it is time to place your pineapple on top of your base. Now with it time for some detail work. Piping the rock path, flowers and borders. For your green top use the centerpiece from a party store, cutting of the top and placing a craft stick in the center so you can stick down into the top of your cake. Cut the straw and place towards the top for the chimney. I envy you guys who have cable tv! Ya'll get such great ideas! This is too cute! My grandaughter would absolutely love it!